"Italian Princess Weds Royal Lover"
Racconigi, Italy, Sept. 23 -- Princess Mafalda , second daughter of King Victor Emmanuel , was married here today to Prince Philip of Hesse  with ceremonies impressive in the simplicity which marked the union of two ancient royal families in an old-fashioned love match. Mafalda, proud daughter of the House of Savoy, renounced ambition when she united her destiny to that of a German prince whose principality was swept away in the upheaval which cost his Hohenzollern uncle  the throne of the German Empire. A group photo taken during Mafalda and Philipp's wedding celebrations. Some notable royal jewels are visible here; the Duchess of Aosta (behind the bride) wears her Stars and Knots Tiara, while Queen Elena (beside the groom's father) wears the pearl and diamond loop tiara. 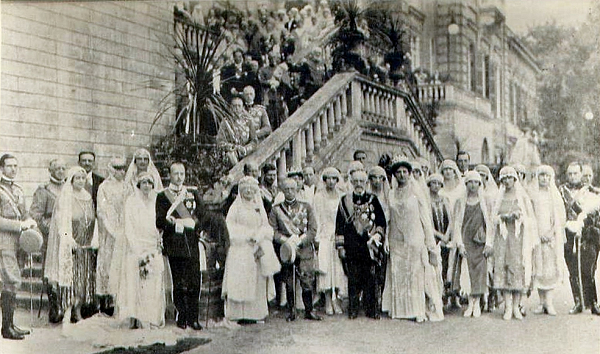 Queen Margherita, standing between the groom and the bride's father, appears to be wearing her diamond floral tiara. The famous old Racconigi Castle was the scene of today's nuptials. There were two ceremonies, the civil and the religious -- the one performed by Premier Mussolini  as head of the government, the other by a venerable old priest who baptized Mafalda and her brother and sisters  -- who has, in fact, baptized and married and buried a generation of scions of the House of Savoy. Promptly at ten o'clock, King Victor Emmanuel, in the uniform of a marshal of the army, appeared at the door of his private apartments, followed by Queen Mother Margherita , who was gowned in silver brocade and wore her famous pearl necklace. Queen Elena , resplendent in gold brocade, followed with King George of Greece . A full-length view of Mafalda's wedding ensemble; she isn't wearing the necklace described in this article. Perhaps the attire described here is from the civil ceremony, not the religious wedding? Mafalda herself, on the arm of the Crown Prince of Romania , then appeared. Her wedding gown was of finely-embroidered white silk over which flowed a priceless veil, inlaid and edged with ancient handmade lace. The royal bride-to-be was wearing the necklace of 300 pearls presented by her brother, Crown Prince Umberto . Premier Mussolini and Signor Tittoni  brought up the rear, following the princes of the House of Savoy. 1. Princess Mafalda of Hesse (1902-1944), born Princess Mafalda of Savoy, was the second child of King Victor Emmanuel III of Italy and Princess Elena of Montenegro. 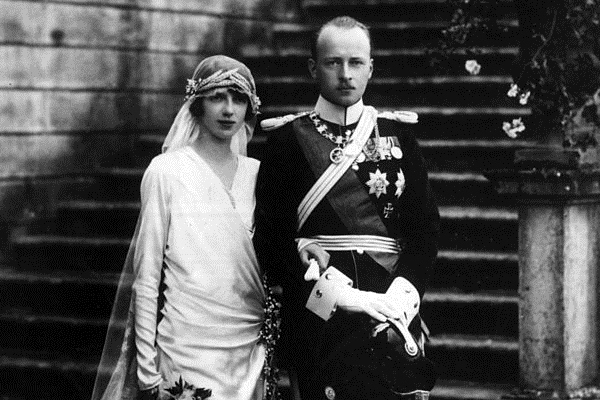 Mafalda's marriage to Prince Philipp of Hesse in 1925 ultimately sealed her fate. Philipp later became a member of the Nazi party, and Mafalda was often in close proximity to high-ranking German officials. Both Hitler and Goebbels suspected that Mafalda was working against them during World War II. After her father had Mussolini arrested, she became an even greater object of scrutiny; she was subsequently arrested by the Gestapo and sent to the concentration camp at Buchenwald. She died in Buchenwald in 1944 after suffering injuries during a bombing raid. Her four children -- Moritz, Heinrich, Otto, and Elisabeth -- were raised by their father after the war. 2. King Victor Emmanuel III of Italy (1869-1947) reigned from 1900 until his abdication in 1946. His reign spanned two world wars; although Italy began World War II on the side of the Axis Powers, Victor Emmanuel's arrest of Mussolini began a shift that led to an armistice with the Allies. His unpopularity led to a referendum on the monarchy in 1946; hoping it would help shift public opinion in favor of continued Savoy rule, he abdicated a month before the vote in favor of his son, Crown Prince Umberto. Italy voted in favor of a republic anyway, and Victor Emmanuel died the following year in exile in Egypt. 3. Prince Philipp of Hesse (1896-1980) was the head of the House of Hesse from 1940 until his death in 1980. He was the third son of Prince Friedrich Karl of Hesse and Princess Margarete of Prussia (who was a granddaughter of Queen Victoria); he had a younger twin brother, Prince Wolfgang. (This Philipp was also the namesake of Prince Philip, Duke of Edinburgh.) Philipp's two elder brothers both died in World War I, leaving him as heir to the headship of the former royal house. While working as an interior designer in Rome, he met Princess Mafalda of Savoy, daughter of the King of Italy, and the two were married in 1925. Five years later, Philipp joined the Nazi party, and his status as a former German prince launched him into the upper ranks of the party. After he was named governor of Hesse-Nassau, Philipp was personally implicated in horrific acts, including the murder of thousands of people suffering from mental illnesses. He reportedly also often served as a go-between for Hitler and Mussolini. During World War II, however, his relationship with higher-ranking Nazis soured, in part because of Philipp's father-in-law's arrest of Mussolini. Philipp was incarcerated in three different concentration camps until the end of the war, when he was arrested by Allied troops and charged for various crimes; those charges were later dropped. After his release in 1947, he was reunited with his children. In 1968, on the death of his cousin, Prince Louis of Hesse and by Rhine, Philipp succeeded to the headship of the cadet branch of the family, reuniting all branches of the Hesse family for the first time since the sixteenth century. He died in Rome in 1980. 4. Emperor Wilhelm II of Germany (1859-1941) was a maternal uncle of Philipp of Hesse; Wilhelm and Philipp's mother, Margarete, were siblings. 5. Benito Mussolini (1883-1945), the founder of the Italian Fascist Party, was Italy's prime minister at the time of this wedding. On Christmas Eve in 1925, he officially became "head of the government" -- a dictator who answered only to the king. He ran Italy as a police state, creating an extravagant system of propaganda that helped him establish a cult of personality. He entered World War II as a German ally, but in 1943, he was ousted by King Victor Emmanuel and arrested. He continued to fight on the side of the Germans until he was killed in April 1945. 6. Princess Mafalda had four siblings: Princess Yolanda, Countess of Bergolo; King Umberto II of Italy; Tsaritsa Giovanna of Bulgaria; and Princess Maria Francesca of Bourbon-Parma. 7. Princess Margherita of Savoy (1851-1926) was Queen of Italy from 1878-1900, through her marriage to her first cousin, King Umberto I. She was the only daughter of Prince Ferdinand of Savoy, Duke of Genoa and Princess Elisabeth of Saxony. Her marriage was primarily one of political convenience, and she became an important influence on her son, King Victor Emmanuel III. She died a few months after this wedding. 8. Princess Elena of Montenegro (1871-1952) was the daughter of King Nicholas I of Montenegro and the wife of King Victor Emmanuel III of Italy. She was noted for her charity work, which was recognized in 1937 when she was presented with a Golden Rose by Pope Pius XII. She followed her husband into exile in Egypt in 1946 after his abdication. She died in France in 1952. 9. King George II of the Hellenes (1890-1947) was in between his two reigns as Greece's monarch at the time of this wedding. He had reigned from 1922 until March of 1924, when a Greek republic was proclaimed; after a controversial plebiscite in 1935, he was restored to the throne, reigning until his death in April 1947. 11. Crown Prince Umberto of Italy (1904-1983), later King Umberto II, was Princess Mafalda's younger brother and heir to the Italian throne. 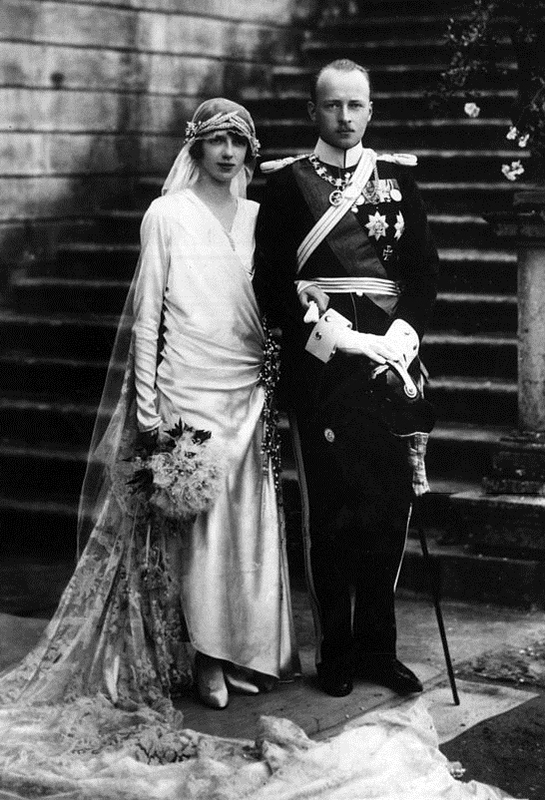 He married Princess Marie Jose of Belgium in 1930. After Mussolini was ousted in 1943, King Victor Emmanuel transferred most of his powers to Umberto; in 1946, with a referendum on the monarchy looming, he abdicated in Umberto's favor. King Umberto II of Italy reigned for only 34 days. His brief springtime reign earned him the nickname of "the May King." He and Queen Marie Jose separated in exile in Portugal, and he died in Geneva in 1983. 12. Tommaso Tittoni (1855-1931), a former Italian prime minister, was serving as President of the Italian Senate at the time of this wedding. A supporter of Mussolini even after he became dictator, Tittoni died in Rome in 1931.